I was the kid who built forts in my backyard – hundreds of them. Subterranean brick forts, wood constructed tree forts, teepees, you name it. My father is one of the best craftsman I know and my mother had us frequently visiting open houses when I was a kid. I studied design in undergrad and then engineering afterward. After working in the corporate world, I was at a crossroads in 2003 between architecture and starting a real estate practice. Nine years later with almost a decade of real estate experience, I determined that a particular Portland housing niche was being overlooked. So I set out in March of 2012 to raise $1,000,000 with the goal of building a specific home to fill a unique gap in the market and to complete what feels like a life long goal. I reference these things because I believe that so many things in my life have culminated in this home. I love residential architecture and interior design. Combining these two passions while having complete authority over the design and construction of this home has been an incredible challenge and an absolute joy. I have picked out every color, every light, every piece of millwork and every bathroom fixture. I have personally worked to adjust the depth of the attic dormer, push the soffit depths, set the sconce heights, expand the island leg widths and change the flatwork elevations. I have poured over every single detail of this 4000 square foot home and had only myself to answer to. Beyond the finishes, I had the rare opportunity to build the exact type of home I wanted. 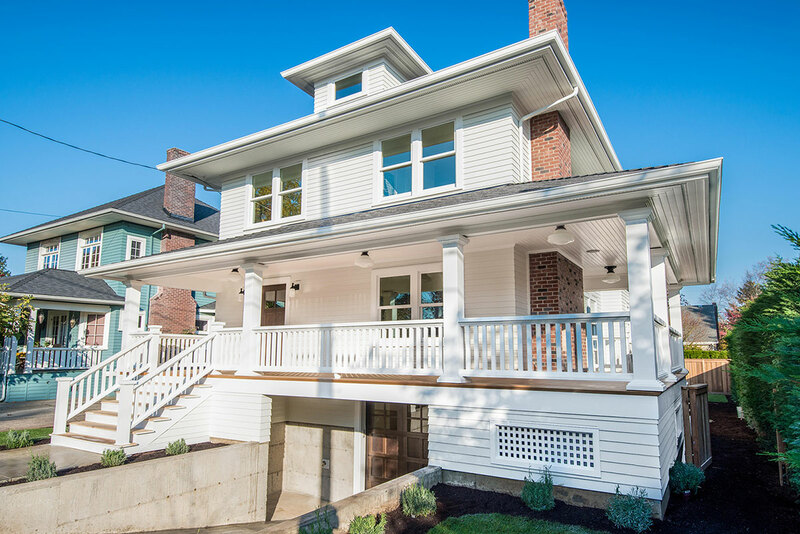 So I chose my favorite early 20th century home and worked to both replicate it and redesign it in an effort to accomplish two primary objectives. First, I wanted to ensure the home looked authentic. Truly authentic. I wanted people to walk or drive past the home and not be able to tell if it was built in 1913 or 2013. Designing the home to ensure this impression took into account many things including the physical setbacks of the homes around me, the scale of the soffits, roof pitches, fascia heights, porch depth and countless exterior finish details. My second objective was that I wanted to resolve two of the shortcomings of the classic 20th century foursquare when considering current modern day homebuyer demands. That resolution required two primary efforts, both of which couldn’t stray too far from the classic floor plan and general aesthetic of my early 20th century model. The first was creating an open floor plan while maintaining the circular flow and classic layout of the original foursquares. I worked to achieve this by ensuring three entry points to almost every room on the main floor, keeping the classic locations of the foyer, dining and living rooms while adding a second set of pocket doors to the dining room so that you could open up the entire right side of the home without obstruction for 46+ feet! The second effort required adding a great room off the kitchen while maintaining the classic architectural aesthetic of the outside of the home. To meet this objective, I added the great room /kitchen by extending the typical depth of the home so that the kitchen ran deep vs. wide allowing the great room area to be more square spatially and the front portion of the home to retain its classic 28 foot width. With the spatial layout hatched 9 months ago and the interior details outlined carefully week after week since then, I am pleased to complete this home before the holidays. After 10 years of practicing real estate I have seen thousands of homes. With a clear sense of why people flock to buy houses in our close-in communities, I am proud to respond to that demand by adding a home to our community that I believe my children’s children will be proud of. I hope this home serves as proof that while very expensive to build, infill homes can still be built for a profit with superior finishes and with a strict application to 20th century architecture.